I have to do a couple of mea culpas right off the bat and admit some things before I go any further. 1). Rich Koslowski is a good friend of mine (well...most of the time) and was my partner on Geeksville, which we self-published for 3 issues (the really GOOD ones) and then 7 more through Image Comics (the not so good ones). Someday maybe Rich and/or I will explain how all the joy of doing your own comic disappears when someone else publishes it. 2). I am not now, nor have I ever been an Elvis fan. While I can recognize the impact and legacy Elvis Presley (particularly the pre-1970 Elvis) had on rock and roll and pop culture, I'd just as soon turn off the TV or the radio when something by him comes on. 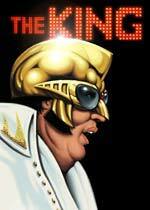 But for me at least, The King, Rich's massive new graphic novel from Top Shelf, is not about Elvis. It's about faith and the things people believe. It's not even really about WHY they believe them, it's about blind faith and how we all need something to believe in. It might be God, it might be A God, a god of music for example. Reporter Paul Erfurt goes on a quest in Las Vegas to decide whether the man they call The King is really Elvis Presley come back to life. Through a series of interviews with a newly reconstituted Memphis Mafia and the help of a private eye, Erfurt discovers the truth about The King and a bit more about faith and how people believe. The King is Koslowski's best work to date and shows a maturity that didn't always come through with his signature characters, The 3 Geeks. A long time ago, Rich told me he wanted to move on to longer stories, and The King shows someone taking his time and doing it right. Originally not to be drawn by Rich, just written, and then delayed even further because of an eye injury (a fact that becomes part of the private eye's--ha! get it?--backstory), this book is literally one that was years in the making. Rich won the 2003 Ignatz Award at SPX for outstanding graphic novel for 3 Fingers, his first long-form book, also published by Top Shelf. Here's hoping more accolades are coming his way for this new book. He deserves it.